Hi Friends! 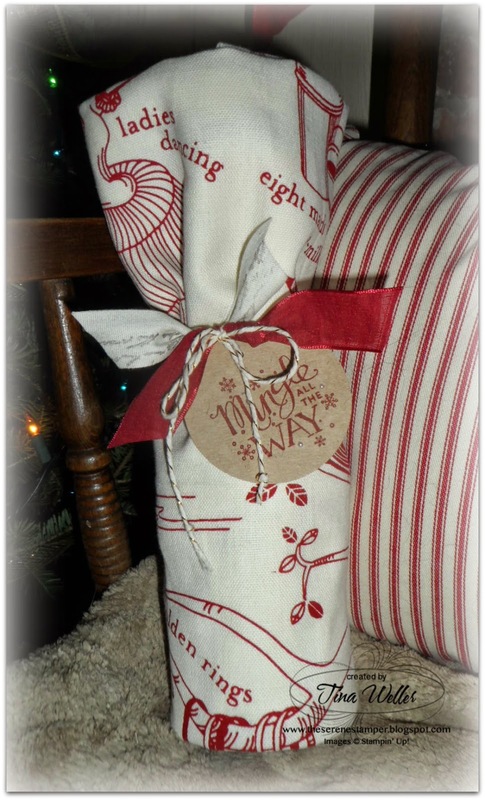 Today I'm sharing a fun way to dress up a bottle of wine or liqueur for a nice Christmas (or any time) gift. Recently I had mentioned to a couple of my friends that my husband and I really enjoy Drambuie (a blend of aged Scotch whisky, heather honey, spices and herbs). They were intrigued as they had never tried it before so I thought I'd get them a small bottle for Christmas (along with some yummy biscotti!). If you've ever tried wrapping a bottle before, you know it can be a little tricky. But I've discovered a really easy and practical way to wrap bottles and other gifts too. 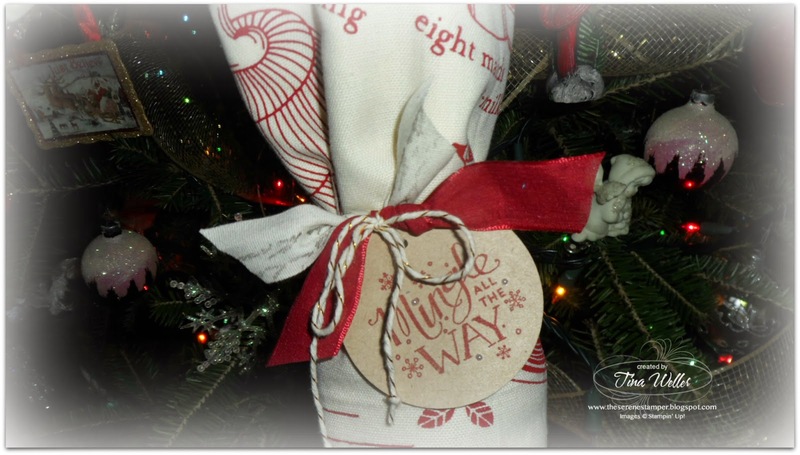 The tag was really easy to make and then I stamped onto the Natural Cotton ribbon, just to jazz it up. To wrap the Drambuie I simply folded the towel in half (top to bottom) and then just rolled up the bottle (tightly). I used two straight pins to hold the seam together and the ribbon finished it off! I added a package of homemade Christmas biscotti along with the Drambuie. I was really pressed for time but thanks to Stampin' Up! bags and tags, the treats were packaged up and ready to give out in no time! I'll post some pictures, along with my recipe for the biscotti tomorrow.